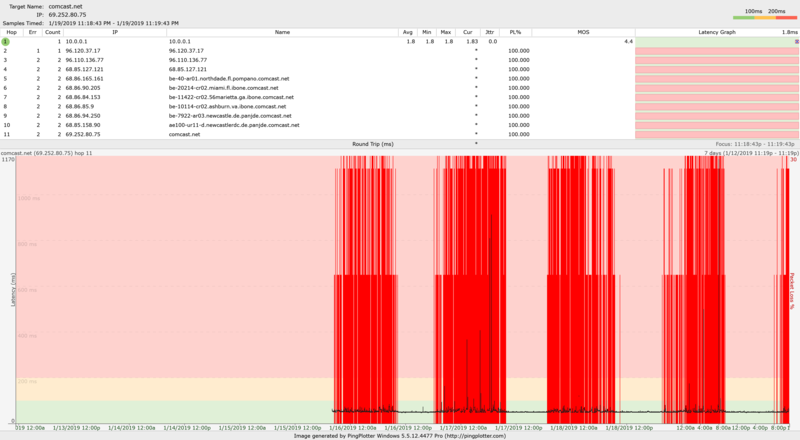 Here is the results of the WinMTR programs monitoring of the network activity when connecting to the game's server (Overwatch). This has been going on for a couple weeks. I have tried flsuhing DNS, resetting router, releasing and renewing IP.. Nothing works. I want to find out whether this is an issue that is widespread or something purely on my end only. Modem is a D Link dcm 301 and router is Netgear WNR 1000. Modem lights remain solid when connecting or connected ot the game. The stats are o/k but that modem and ESPECIALLY that router are quite long in the tooth. Do you have the same problem with a direct connection to the cable modem (no router in the mix) ? Well this is going to make no sense but connecting the ethernet directly to the comp and leaving out the router made the connection much worse. My ping to the game when connected was between 350 and 500 when it's typically 70 which is still bad to begin with. Even trying to load this browser window made it time out. The stats are o/k but that modem and ESPECIALLY that router are quite long in the tooth. mix) ? I agree with @EG here. Neither of those devices are going to provide you with optimum service. Time to upgrade. But the thing is I want to know if it's really the modem or the connection. It could be something with the wires outside. I would like to really narrow down the problem. I don;t want to waste money on a modem just to find out it's not the major issue.